By Tammi KellyOkeechobee News In 2006 Teresa Chandler and her daughter Allison moved to Okeechobee. After 12y ear-old Allison attended school for a few months she arrived home and spoke to her mom about a concern she had. She said that there was not enough for kids her age to do in Okeechobee. Can we start having some dances? Allison asked. The Chandlers moved from West Palm Beach where Allison had gone to YMCA dances and had enjoyed them. Allison at the age of 12 knew she had to change things in this town for the kids to have some fun. Teresa started to gather the things needed to make her daughters request possible, such as location, food, supplies and etc. The rst dance was at Pier II resort and all the funds from the ticket and food sales went to the American Red Cross in Okeechobee. The rst dance was a huge success with over 100 kids in attendance. W ho knew this was only the beginning? The dances soon moved to the Shine Club, which the club was grateful that the space was donated. Dances were held there for about a year and at each dance all the funds would go to a local non-pro t such as the American Cancer Society, YMCA, Castle, Communities in Schools, Real Life Childrens Ranch and more. They continued the teen dances through the years moving to the Freshman Campus Auditorium (courtesy of the school board) and occasionally uses the South Elementary Cafeteria. Teresa Chandler decided to create a nonpro t for the dance program so the proceeds w ould bene t the students directly such as themes for the dance, supplies and two Okeechobee High School scholarships for $500 each. When asked why the name B.R.A.T. Club? Because of what it stands for: Building Relationships Among Teens, said Teresa Chandler. When I told Allison I wanted to call it B.R.A.T. Club she said we dont want to be called brats and I thought it was cute, she continued. The B.R.A.T. Club Inc. holds dances every month upon availability of the venue. Dances range in themes from Halloween, Valentines Day, Easter and Christmas. Many places of business donate to the B.R.A.T. Club including: Ding-A-Ling Deli, Dominos, BuxtonSeawinds, DP Productions, Eastcoast Signs, Publix, Papa Johns, Okeechobee County Sheriff, Okeechobee City Police, Okeechobee News, Waste Management, WOKC Radio and Okeechobee County Schools, Jerry LaFavre, Beef O Bradys, March of Dimes, Guardian ad Litem, Dairy Queen, Slide on By Party Supply, Holiday Inn Express, East Coast Signs & Shirts. Now B.R.A.T. Club will hold a Dodge Ball Tournament March 1 in Flagler Park #3 starting at 9 a.m. All proceeds are put back into the B.R.A.T Club for future events. Space is limited for the rst 30 registrations, so contact Allison Chandler at 863-697-9096 or email her at alsn@embarqmail.com. The next B.R.A.T. Club Dance is a Feb. 15 and it is a Black and White night theme where ladies wear white and gentleman wear black. Dance is ages 12-16. Dance goes from 7 to 10 p.m. and its $7 and includes soda, pizza, chips and more. 2 Serving the communities south of Lake Okeechobee May 27, 2010 Buy a Home Delivery subscription for $6 a monthand receive an E-Subscription FREE* Your local news available right at your fingertips! Call (863) 763-3134 today! When you enroll in our EZPAY subscription planStay in the know with anE-subscription 7 6 3 6 9 0 5 Y Y o u r L a r g e s t F e n c e P o s t S u p p l i e r i n S o u t h F l o r i d a 7 6 3 6 9 0 5 T h e W o r k s A l l S i z e s P o s t s S t a p l e sG a u c h o A l l i g a t o r F e n c eW a l p o l e F e e d & S u p p l y C o 7 6 3 6 9 0 5 Hwy 98 N. Okeechobee MOVIE TICKETS:Adults $6.50 Children 12 & under $5.00 Senior Citizens $5.00 all movies Matinees $4.50Fri., Jan. 17TH Thurs., Jan. 23RDFor Info, Call 763-7202 II:  THE NUT JOBFri., Tues. & Thurs. 7:00 & 9:00, Sat., Sun. & Wed. 2:00, 4:15, 7:00 & 9:00, Mon 3:00 & 7:00I: SAVING MR. BANKSFri., Tues. & Thurs. 7:00 & 9:00, Sat., Sun. & Wed. 2:00, 4:15, 7:00 & 9:00, Mon 3:00 & 7:00III: JACK RYAN: SHADOW RECRUITFri., Tues. & Thurs. 7:00 & 9:00, Sat., Sun. 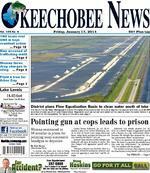 & Wed. 2:00, 4:15, 7:00 & 9:00, Mon 3:00 & 7:00 PG-13 PG PG-13 2 Okeechobee News January 17, 2014 Today: Partly cloudy. High 64F. Winds light and variable Tonight: Partly cloudy skies. Low 47F. Winds WSW at 5 to 10 mph.Extended ForecastSaturday: Sunny. High 57F. Winds N W at 10 to 20 mph. Saturday Night: Clear skies. Lo w around 35F. Winds light and variable. Sunday: A mainly sunny sky. High 69F. Winds W at 10 to 15 mph. Sunday Night: Clear skies. Low 44F. Winds WNW at 5 to 10 mph. Okeechobee Forecast B.R.A.T. Club Inc. reaches eighth year of success Jan. 17, is Arbor Day and the Florida Forest Service wants to inspire you to plant, nurture and celebrate trees. Now is the best time to plant a seedling tree (bare root), explains Senior Forester Calin Ionita, Florida Forest Service. Winter and early spring in general are a good time for planting trees because trees enter a dormant period. They slow their activity during the winter thus making it easier to handle the tree with the least amount of stress. Already established root ball trees can be planted all year round in Florida. Florida has been celebrating Arbor Day since 1886. Arbor Day was rst celebrated on April 10, 1872 in Nebraska City, Neb. The founding father of Arbor Day is J. Sterling Morton who moved from Detroit to Nebraska; living in Nebraska he missed the serenity of trees. In 1872 he introduced tree-planting day resolution to the State Board of Agriculture. On April 10, 1872, Arbor Day was celebrated and it was believed that more than one million trees were planted in Nebraska that day. Help us celebrate J. Sterling Mortons legacy of Arbor Day by planting a tree. Plant a tree to grow with your family Senior Forester Calin states. Trees reduce sound, produce oxygen, store carbon, clean the air, provide shade, reduce wind and erosion and increase property values. There are other ways to celebrate Arbor Day including: taking a walk through a forest, state, county, city park; reading a book about trees to a loved one; baking with nuts or seeds from trees; painting, drawing or writing about the trees in your area. For more information about trees (planting tips, types of trees and diseases), please contact Senior Forester Calin Ionita (863) 655-6409 or at Calin.Ionita@FreshFromFlorida.com. Plant a Tree in Celebration for Arbor Day Allison Chandler Teresa Chandler Special to the Okeechobee NewsB.R.A.T. Club board of directors pictured from left to right: (back row) Bryant Culpepper, Judge Jerald Bryant, Sheriff Paul May, Frank DeCarlo and Matt Buxton; (front row) Tiffany Peters, Teresa Chandler, Tammi Kelly and Allison Chandler. T urn signals I know they teach drivers education at OHS and I would like to make a plea to t he instructor to spend some time explaining the importance of using turn signals t o let other drivers know your intention to c hange lanes or turn. And then maybe the kids could explain that to their parents and grandparents because the majority of drivers in this town dont seem to know how to use a turn signal.Handicapped parking Now that the winter visitors are back, t here is a lot more competition for the handic apped parking spots. I know some people abuse them, using the handicapped parking s pot even when the handicapped person is not in the vehicle. That is illegal. The permit applies to the person, not the vehicle. If the c ar has a sticker or permit, it is only legal to use the handicapped parking if the disabled person is in the vehicle. If another family member is just using the vehicle, leave those s pots for those who really need them. T exting in a theater In the news is the story of an argument over cell phone use in a theater that ended up in a shooting with one dead. According t o the news, a 71-year-old former cop repeatedly asked the man in front of him at the t heater to put the cell phone away, but he refused. The older man left to nd a manager, b ut came back without one and upset. The man who had been texting turned around and continued to argue with the 71-year-old, popcorn was thrown and the 71-year-old pulled a gun and fatally shot the texter. Ironic ally, signs in the front of the theater state t hat weapons are banned from the theater as is all cell phone use including texting. Is t his what our society has come to? Civility is a thing of the past. And what most people w ould consider a minor argument between s trangers ends up with one dead.  I have often wished movie theaters would just put in the devices that block all phone signals in the theaters because it really is annoying when the person in front of you uses the cell phone during the lm. Even if they are texting, the bright light from the screen is distracting. But shooting someone over it? I have to wonder if the older man suffered some kind of mental breakdown or some kind of ashback that triggered his actions.  Turning cell phones off upon entering could be put in place at all theaters. Then if someone uses them they should be asked to leave. I nd it very distracting for anyone to use a cell phone in theaters.  The theater where the shooting took place had a sign on the door that said no cell phone use in the theater, including texting. But obviously they werent enforcing it. They also apparently had no way to enforce the ban  also posted  on bringing weapons into the building. I wonder if the theater might face a lawsuit because when the older man went to ask the management for help in dealing with the guy who wouldnt stop texting, the theater management did not do anything. Had they just sent a staffer in to ask the guy to put the phone away, the second argument could have been avoided.  Seeing the story about the texting shooting in the news, it made me think of the many times someone in front of me or sitting in my same row has started texting during a movie and how disruptive that is. The light from a cell phone is really distracting to those around you, especially those sitting behind you. If a message is so important that it cant wait until after the movie, go to the lobby. When the lights go down in a theater, cell phones should be turned off.  It was an afternoon showing of a lm. There were likely tons of open seats in that theater, but rather than simply move to a seat where the light from a small screen wouldnt bother him, he chose to confront someone, make complaints to management, and then ultimately shoot a husband and father who was texting his young daughter. It looks like now that he has a recent history of confronting other people in the same theater for cell phone use, he decided to become some sort of vigilante to combat the terrible offense of theater texting. Dude needed to get Net ix and some microwave popcorn if he was getting that worked up over it on a regular basis. Mission needs helpA will to continue serving the less fortunate Bruce and Maryanne Swinford are the backbone of Big Lake Missions Outreach program in Okeechobee. The mission started in 1995. The non-pro t organization provides a food pantry, hot meals everyday from noon-1 p.m. (except Saturdays & Sundays), a clothing closet, personal hygiene items, household items (except furniture), school supplies and a toy drive once a year. The husband and wife team provide lunch to the less fortunate behind the First United Methodist Church in Okeechobee, 200 N.W. Second St. In 2010, Bruce suffered a great illness. Doctors discovered a cyst on his pancreas. Bruce went in for the surgery and then suffered an infection throughout his entire body. He spent nine months in the hospital to recover. I dont like hearing the word, disabled, says Bruce. I believe an idle body, stays idle. I had the will to get better and keep serving and thats exactly what I did! Big Lake Missions Outreach is operated as a 501(3)c, licensed and chartered with the Association of International Gospel Assemblies (A.I.G.A.) and functions with 100 percent from churches and private individuals. The primary vehicle used at the mission is a 2004 Chevrolet with 218,000 miles on the odometer. The mission is desperatel y in need of a newer vehicle to help with operations. Bruce and Maryanne are hoping to raise enough money through donations and awareness to ful ll this need in 2014. If you are interested in helping Big Lak e Missions Outreach or need more information, please contact Bruce or Maryann e Swinford at 863-763-5725. Teresa Chandler January 17, 2014 4 Okeechobee News OPINION Public Forum/Speak Out Letters to the editor Speak Out has moved online, where i t is quicker and easier to share your i deas and converse with others. Go to w ww.newszap.com, click on the comm unity name and your local or state P ublic Forum. There, you can create n ew topics or comment on existing t opics. What follows is a sam pling of s ome of the discussions currently taki ng place. Thanks for participating! Five Wishes Workshops plannedFive Wishes Workshops will be held at the Okeechobee Public Library, 206 S.W. 16th St., at 2 p.m. on: Thursday, Feb. 6; Thursday March 6; Thursday, April 3; Thursday May 8; Thursday, June 5; Thursday, July 10; Thursday Aug. 7; Thursday, Sept. 4; Thursday, Oct. 2 and Thursday Nov. 6. Five Wishes is a brochure/check list which explains what an individual should do with regard to The Five Wishes in case of serious illness.Scholarships sought for OHS studentsJoin the 126 donors this year and help support the Okeechobee High School Class of 2014. Scholarships give students encouragement; it is a monetary investment in them as individuals. There is a great sense of pride students feel when they are told I believe in you as a student, here is a scholarship to prove it. The smiles show it all. Help our kids see their true potential, join the round up today! To sponsor a scholarship, or to gather information about the Round Up, contact Kati Lawson at kati.lawson@okee.k12. .us; or, call 863-462-5025, ext. 3113. Special to the Okeechobee NewsPictured: Waste Management Community Relations Teresa Chandler, Waste Management Of ce Manager Pam Casperson with Big Lake Mission's Maryanne and Bruce Swinford. answered a complaint around 10 p.m. that someone was shooting stray cats in the area of some apartments on U.S. 98 N. Deputy Marcus Collier knocked on an apartment door a couple of time when a w omans voice called out Who is it? He then identi ed himself as being a deputy w ith the sheriffs of ce, stated his arrest report. But, she did not come to the door, the report continued. At this point Deputy Collier, along with Deputy Robbie Lamb, started walking to the back of the building while Deputy John Hazy stayed at the front door. Before the two deputies got around the corner of the apartment, the front door  ew open and a woman stepped out with a black semiautomatic handgun and pointed it at Deputy Hazy, stated an OCSO arrest report. The deputies pulwled their weapons and ordered Stallworth to drop her .40 caliber semi-automatic handgun. Deputy Collier stated in his arrest report he later learned her gun had one round in the chamber and 10 rounds in the magazine. Stallworth threw the gun back into the apartment, and it was retrieved by Deputy Lamb, the report added. Deputy Collier pulled Stallworth out of the apartment and placed her in handcuffs. According to arrest reports Stallworth claimed she thought it was her cousins at the door, and they always play jokes like that. When questioned, Stallworth reportedly denied hearing anyone call out its the sheriffs of ce. She also denied shooting any cats. The OCSO reports stated deputies did nd one cat that had been shot. Court records show Stallworth was represented by defense attorney Brandie Tindall, from the public defenders of ce. 2 Serving the communities south of Lake Okeechobee May 27, 2010 We are pledged to operate our newspaper as a public trust. Fairness is extremely important to us. We admit our errors promptly and we dont bury the corrections. (If error appears on the front page, thats where we print the correction.) Sometimes people dont like what has been written about them. In those cases, we offer a right to reply and allow them to tell their own side of the story. How are we doing? Let us know by emailing feedback@newszap.com or call your editor.Community Service Through Journalism 5 Okeechobee News January 17, 2014 PRISONContinued From Page 1 By Eric KoppOkeechobee News An Okeechobee man caught with approximately 78 grams of suspected methamphetamine is being held on bond in the Okeechobee County Jail. Hilliard John Gopher, 23, N. Tucker Ridge Road, w as arrested Wednesday, J an. 15, on a felony charge of traf cking in methamphetamine more than 40 grams. He w as also charged with the misdemeanors of possession of marijuana under 20 grams, possession of drug paraphernalia and driving while license suspended. Gopher is being held in the county jail on $103,000 bond. An arrest report by a detective with the Okeechobee Narcotics Task Force stated that a traf c stop was conducted on a dark green 2000 Ford pickup in the 2100 block of S.R. 78 W. After stopping the truck the detective asked the driver, Gopher, for his drivers license but Gopher told the detective he did not have a valid license. While talking with Gopher, the veteran investigator reportedly saw ... on his left forearm, blood dripping from what appeared to be a fresh needle injection. During a search of the vehicle, the detective reportedly found about 78 grams of a powder substance in a purse behind the drivers seat. A eld test was done on the powder, and that test allegedly indicated a positive result for the presence of meth. The detectives report goes on to state that less than a gram of suspected marijuana was found in a cup holder. The detective also found some purple and pink capsules in a cellophane wrapper and some pills that had no pharmaceutical markings on them, added the report. A eld test was performed on the suspected marijuana and it reportedly indicated a positive result for the presence of pot. Also found under a cup holder was a used syringe, added the detective. A records check found that on Jan. 9, 2012, Gopher was found guilty of possession of oxycodone, possession of alprazolam, possession of new or legend drugs without a prescription, possession of marijuana under 20 grams and possession of drug paraphernalia. Then, on July 24, 2012, Circuit Court Judge Sherwood Bauer found Gopher guilty of possession of oxycodone and possession of drug paraphernalia. Gopher was then sentenced to a year in the county jail, with a credit for time served of two months and 23 days. Man charged with traf cking meth Hilliard John Gopher WEST PALM BEACH  At an expanse that will help send clean water to Americas Everglades, the South Florida Water Management District (SFWMD) Thursday marked the beginning of construction on a key project in the States Restoration Strategies plan. The vast storage reservoir, known as the A -1 Flow Equalization Basin, will work in tandem with the districts stormwater treatment areas to clean water owing into the Everglades. Engineers from the South Florida Water Management District were able to use ingenuity and hard work to design this project the largest component of Governor Scotts Everglades Water Quality Restoration Plan, said Florida Department of Environmental Protection Secretary Herschel T. Vinyard Jr. I want to thank Governor Scott for his support as well as the dedicated staff at DEP and the Water Management District for moving forward with projects that will improve water quality for the Everglades. Today is when project planning becomes construction progressas we continue improving Everglades water quality, said SFWMD Governing Board Chairman Daniel OKeefe. The A-1 Flow Equalization Basin is a signi cant step toward meeting state water quality standards through the Restoration Strategies plan.A-1: How it WorksWith the capacity to hold 60,000 acrefeet of water at a site west of U.S. 27, the A-1 Flow Equalization Basin (FEB) will capture and store peak stormwater ows during the wet season or heavy rainfall events. Along with providing signi cant storage, vegetation such as bulrush and cattail within the site will help reduce the concentration of phosphorus in the water. When complete, a system of 21 miles of earthen levees and 15 water-control structures will hold water and allow managers to move it south for treatment. This provides the steady ow necessary to optimize the performance of Stormwater Treatment Areas (STAs) 2 and 3/4 located near the Palm Beach/Broward county line. Stormwater Treatment Areas are constructed wetlands that serve as the watercleaning workhorses of Everglades restoration, using both emergent and submerged aquatic vegetation such as hydrilla to naturally remove nutrients from the water that eventually ows to the Everglades. The district operates a network of ve STAs south of Lake Okeechobee with an effective treatment area of 57,000 acres. Since 1994, the treatment areas have retained more than 1,707 metric tons of total phosphorus that would have otherwise entered the Everglades. The A-1 FEB will incorporate work already completed at the site originally planned to provide deep water storage, known as the EAA Reservoir. All of the material excavated for the reservoir will be utilized to build new levees, and existing canals have been incorporated into the new plan.Restoration strategiesIn June 2012, the State of Florida and the U.S. Environmental Protection Agency reached a consensus on new strategies for improving water quality in Americas Everglades. Based on months of scienti c and technical discussions, these strategies will expand water quality improvement projects to achieve the phosphorus water quality standard established for the Everglades. Reservoir to clean water before it enters Everglades Motorcycle giveaway bene t helps local womanA 1996 Harley-Davidson Dyna Low Rider motorcycle, and a drive-on trailer, is being given away as part of a fundraiser to bene t 21-year-old Casey Lawrence of Okeechobee. The winning ticket will be drawn by Ms. Lawrence on April 12 during the Okeechobee Bike Fest event at the Cypress Hut Eagles Lodge, 4701 U.S. 441 S.E. For tickets, contact Marc Sandlin at The Style Studio, 863-697-1321; Matt Buxton at Buxton & Bass Funeral Home, 863-634-3706; or, Frank DeCarlo at American Drilling Services, 863-634-1595. The motorcycle can be seen at The Style Studio, 1600 S.R. 70 E.
2 Serving the communities south of Lake Okeechobee May 27, 2010 Dallas and Rene Chartier celebrated their 50th wedding anniversary at the home of their son and daughter-in-law, Rick and Robbie, surrounded by family and friends from those 50 wonderful years. Congratuations Mom and Dad. RENE CHARTIER ANNIVERSARY DALLAS CHARTIER AA degree in 2011 and a Bachelors degree in Nursing in 2012. She is currently attending the University of South Florida, College of Nursing to obtain her Masters degree in Adult-Geriatric Primary Care. Her plans after completion are to work as a Primary Care Nurse Practitioner in Okeechobee. Jared graduated from Okeechobee High School in 2003. After graduation from high school, he attended Santa Fe Community College and is currently employed by H.W. Rucks & Son Dairy. Both the bride and grooms families have been involved in the dairy business for several generations. The couple will reside in Okeechobee. A wedding in March is being organized. JARED SIMS HANNAH BISHOP Perry and Janet Bishop, along with Allen and Robin Sims, both of Okeechobee, are pleased to announce the engagement of their children, Hannah Kay Bishop to Jared Allen Sims. Grandparents of the bride are Donald and Diane Bishop of Lorida, Fla.; Mrs. Dawn (Jake) Frazier, Mrs. Sharon White and the late Murphy White all of Okeechobee. Grandparents of the groom are Tommy Sr. and Betty Rucks of Okeechobee and Mrs. Eloise Sims and the late Harold Sims of Ocoee, Fla. Hannah graduated from Okeechobee High School in 2007. She attended IRSC for her nursing degree and graduated with her Associates degree in Nursing in 2010, an ENGAGEMENT 10 Okeechobee News January 17, 2014 Special to the Okeechobee News/ CESCES Students of the weekCentral Elementary School would like to congratulate the students of the week for the week of Jan. 10: Jamya Tarbox, Daniel Antunez, Christian James, Reva Sharma, Monesha McDuf e, Wyatt Lowe, Jordan Gabor, Danika Harden, Eduardo Cruz-Diaz, Kobey Hare, Mary Najer-Tovar, Alex Tellez, Manuel Alvarez, Jathan Diaz, Deni Yantez, Ashlynn Hayden, Alexis Murphy, Rosa Salas, Adam Thomas, Kevin Bertram, James Mericle, Victor Rodriguez, Walter Romero, Veronica Aguirre, BreAnna Christie, Marysa Farmer, Lindsey Mijarez, Aven Selph, Victor Solis, Faith Simmons and Alexx Hernandez. Special to the Okeechobee News/ NESStudents of the weekNorth Elementary School would like to congratulate the students of the week for the week of Jan. 13: Melisa Lopez, Reese Taft, Savannah McCoy, Emmy White, Caden Ciorrocco, Jared Rodriguez, Merelaysia Billie, Aubrey Clay, Berenice Hernandez, Ayla Rucks, Yaquelin Gomez, Adriana Mendez, Ethan Blome eld, Rosa Arias, Brandon Perez, Milagras Baltazar, Naomi Nunez, Justin Nieland, Mariela Delacruz, Conner Rucks, Javier Cruz, Angie Morales, Dustin Allen, Marcos Gomez, Seyram Akahoho, Ben Scott, Vincent Fennell, Andrik Virto, Melany Anton, Kimberly Shaw, Erick Ayala, Ariana Silvas, Yaire Ayala-Rodriguez, Jesus Hernandez, and Chelsea Thornton. Houses RentDixie Ranch Acres area. 2 br. Duplex @ 10005 NW 64th Ave. Clean, quiet. Pets allowed upon approval. $550 month. Water & lawn maintenance included. $400 Sec. 863-610-0001 Newly remodeled & painted 3bdrm/1b. house in Dixie Ranch Estates on a large lot. First, Last & Security No Pets. $800.00 a month 863-634-2820 NICE, CLEAN HOUSE, 3BR/2 BATH, 8316 NW 80TH AVE. DIXIE RANCH ACRES, $850/MO., $600 SEC. PETS ALLOWED UPON APPROVAL 863-610-0001 OKEE2/1 $498.00 and 3/2 $ 600.00 Newly updated 12 miles N.E. of town center. Lawn, pest, trash and water included Call for details. Mon -Fri. No Pets 863-467-9800. TAYLOR CREEK ISLES 2 br./1 ba. CBS house on quiet Cul-de-sac. New carpet & paint. No Smkg. inside house. Small pet upon approval and will require additional deposit. $875 mo. plus Utilities. 1st., last, & Sec. reqd. Application must be completed for background checks. For more info. 863-610-1276. Houses SaleFor sale 3bd/1.5ba completely renovated and furnished sale price $13,400 or rent price $700/mo. for 6 months or $650/mo for 12 months 1st, last and sec. in Adult park 863-623-4412 or 304-687-0715 Kissimmee River 2 Bedroom 2 Bath older MH located on an acre of land on the Kissimmee River in the Fly In Community of River Acres. $80,500. No reasonable offer refused. Call 954-931-3732 for more info. Lots SaleFOR SALE BY OWNER LOT IN ANCIENT OAKS, EXTRA-LARGE CONCRETE PAD, NICE. BLOCK 4 LOT 3, $10,500.00, SHED $2,000.00. CALL 561-313-9382 Looking for a place to hang your hat? Look no further than the classifieds. Lots SaleOAKS OF BLUE HERON BUILD YOUR DREAM HOME. PRICED TO SELL BY OWNER. RESIDENTIAL LOT ADJOINING THE GOLF COURSE. $22,500.00 CALL 863-634-2820 TREASURE ISLAND LARGE FENCED LOT WITH BEAUTIFUL OAK TREES. BUILD A HOME OR PUT MOBILE HOME ON LOT. $14,500.00 863-634-2820 Mobile Home Rent2 BEDROOM 1 BATH M.H., PAY $150 WEEKLY NO PETS 1ST & LAST WEEKS RENT $500 SECURITY DEPOSIT UP FRONT 863-634-7861 BUCKHEAD RIDGE 2bd/2ba Dble Wide, central air, yearly lease. $500 mo. plus sec. 3bd./2ba Dble Wide. $600 mo. plus sec. No pets. Call 863-763-4031 TREASURE ISLAND : 2 BR, 2 BA, Non smoking env. No pets. $800 mo. 1st, last & $500 sec. dep. Call (863)634-6114 Mobile HomeSaleFOR SALE 1997 14ft wide Chariot Park Model, w/14ft addition in Ancients Oaks 55+ Resort. 2bdrms w/king & queen bed, 2 baths, large livingkitchen & dining, laundry room w/washer, dryer & freezer. 28ft wide carport, 8x18ft screen porch extra, wide lot app. 1,000ft living area $82,500.00. Contact Lowell at: 5344 SE 65th Terrace Okeechobee Fl. PH.863-467-0669, Cell#309-269-3167 or IL#309-764-0310 Palm Harbor Factory liquidation Sale 6 models to choose from. 1200 sq ft up to 2400 sq ft...$12K OFF John Lyons 800-622-2832 ext 210 for details. Reading a newspaper helps you understand the world around you. No wonder newspaper readers are more successful people! Mobile HomeSaleREDUCED PRICE MOBILE HOME FOR SALE VANTAGE OAKS 55+ PARK NEW AIR COND., SCREEN ROOM CALL FOR MORE INFO 863-484-0501 OR 863-447-1370 Boats1999 ALUMINUM 21ft SUN TRACKER DECK BOAT,120hp MERCURY MARINE ENGINE,TROLLING MOTOR, LIVE FISH WELL,FISH FINDER AND PEDESTAL SEATS ON FRONT. 2004 BOAT TRAILER. $4,500.00 863-763-3006 2000 ALUMINUM BASS TRACKER 17 W/TRAILER, 75 HORSE TROLLING MOTOR, DEPTH FINDER, ON BOARD CHARGER, COVER, EXCELLENT CONDITION $4,800. 863-623-5360 FLATS BOAT 1996 ACTION CRAFT,2009 EVINRUDE 115hp ETEC W/WARRANTY UNTIL APRIL 2014, 2013 ROAD KING ALUMINUM TRAILER,JOHNSON 12volt TROLLING MOTOR,LOWRANCE FISH FINDER,CB RADIO $8,200.00 863-357-2586 Campers/RVsWanted all Travel Trailers, Motor Homes and Fifth Wheels. Any Condition, Cash paid on the spot Call 941-347-7171 Motorcycles2006 HARLEY DAVIDSON ULTRA CLASSICBRANDYWINE COLOR-19,422 MILESSTAGE 2 KIT-AIR RIDE SEAT-DOUBLE STACKED GLOLIGHTS AND RAILS, MASTER TUNER-OVER $6,000 IN ADD ON CHROME&EXTRAS. GREAT RIDE-$13,500. 317-979-2104 Travel Trailers2005 29 Travel Trailer berglass, 1 slide, excellent condition, Riverbend Park, water site $8,800 call 518-569-1736 or 518-586-1927 Need a few more bucks to purchase something deer? Pick up some extra bucks when you sell your used items in the classifeids. Autos WantedCASH FOR CARS No Title Needed, Any Condition. 268junk.com Located in Okeechobee Call (863)268-5865 Utility Trailers2008 PACE BOX TRAILER SINGLE AXLE DOUBLE DOORS AND 1 SIDE ENTRY DOOR LIKE NEW $1,800.00 CALL 863-763-3006 Public Notice PUBLIC NOTICE INDIAN RIVER STATE COLLEGE NURSING DEPARTMENT WISHES TO ANNOUNCE THAT IT WILL HOST A SITE REVIEW FOR CONTINUING ACCREDITATION OF ITS ASSOCIATE DEGREE AND BACCALAUREATE DEGREE NURSING PROGRAMS BY THE ACCREDITATION COMMISSION FOR EDUCATION IN NURSING, INC. YOU ARE INVITED TO MEET THE SITE TEAM AND SHARE COMMENTS ABOUT THE PROGRAM IN PERSON AT A MEETING ON FEBRUARY 4, 2014, FROM 4:00 P.M. TO 5:00 PM. IN ROOM H-106 AT THE INDIAN RIVER STATE COLLEGE MAIN CAMPUS, 3209 VIRGINIA AVENUE, FORT PIERCE, FORIDA 34982. WRITTEN COMMENTS ARE ALSO WELCOME AND SHOULD BE SUTMITTED DIRECTLY TO: DR. SHARON TANNER, CHIEF EXECUTIVE OFFICER ACCREDITATION COMMISSION FOR EDUCATION IN NURSING 3343 PEACHTREE ROAD, NE, SUITE 850 ATLANTA, GEORGIA 30326 OR EMAIL: SJTANNER@ACENURSING.ORG ALL WRITTEN COMMENTS SHOULD BE RECEIVED BY THE ACEN BY JANUARY 29, 2014. 460341 ON 1/17/2014 PUBLIC NOTICE The Okeechobee County Board of County Commissioners will hold its Regular Session on Thursday, January 23, 2014 at 9:00 a.m. in the Judge William L. Hendry Courtroom at the Historic Courthouse, 304 N.W. 2nd Street, Okeechobee, Florida. Any person deciding to appeal any decision made by the Board of County Commissioners with respect to any matter considered at this meeting will need a record of the proceedings, and that, for such purposes, he or she will need to ensure that a verbatim record of such proceedings is made, which record shall include the testimony and evidence upon which the appeal is to be based. In accordance with the Americans with Disabilities Act, persons with disabilities needing special accommodation to participate in this proceeding should contact the County Administrators Of ce not later than four (4) working days prior to the proceeding at 304 N.W. 2nd Street, Room 123 Okeechobee, Florida 34972, or call 863.763.6441. If you are hearing or voice impaired, call TDD 1-800-222-3448 (voice) or 1-888-447-5620 (TTY). Frank Irby, Chair Board of County Commissioners Okeechobee County, Florida Sharon Robertson, Clerk Board of County Commissioners Okeechobee County, Florida /s/ Paula Poskon/ Deputy Clerk 459642 ON 1/17/2014 NOTICE OF APPLICATION FOR TAX DEED 2014TD050 NOTICE IS HEREBY GIVEN, that TOM FELDT the holder of the following certi cate has led said certi cates for a tax deed to be issued thereon. The certi cate number and year of issuance, the description of the property, and the names in which it was assessed are as follows: Certi cate No: 96 Year of Issuance: June-01-2009 Description of Property: LOT D OF TRACT 14 W1/2 OF W1/2 OF N1/2 OF N1/2 OF TRACT 14 09 34S 33E 1-09-34-33-0A00-00014-D000 Said property being in the County of Okeechobee, State of Florida Name in which assessed: LUCITO FABIEN Unless said certi cate shall be redeemed accor ding to law the property described in such certi cate shall be sold to the highest bidder at the Okeechobee County Judicial Center, Jury Assembly Room, 312 NW 3rd Street, Okeechobee, Florida 10:00 A.M. on the 6th day of February, 2014. SUBJECT TO CURRENT TAXES SHARON ROBERTSON, CLERK OF CIRCUIT COURT Okeechobee County, Florida /s/ Robin R. Parrish Deputy Clerk NOTICE REGARDING THE AMERICANS WITH DISABILITIES ACT OF 1990; In accordance with the Americans With Disabilities Act, persons needing a special accommodation to participate in this proceeding should contact Court Administration no later that seven days prior to the proceeding at 250 NW Country Club Drive, Port St. Lucie, Florida 34986, 1.772.807.4370 within two working days of your receipt of this notice. IF YOU ARE HEARING IMPAIRED CALL 1.800.955.8771; IF YOU ARE VOICE IMPAIRED CALL 1.800.955.8770. 456916 ON 12/27/2013 1/3,10,17/2014 Public NoticeNOTICE OF APPLICATION FOR TAX DEED 2013TD298 NOTICE IS HEREBY GIVEN, that FL DUNDEE LIEN INVESTMENTS LLC the holder of the following certi cate has led said certi cates for a tax deed to be issued thereon. The certi cate number and year of issuance, the description of the property, and the names in which it was assessed are as follows: Certi cate No: 3834 Year of Issuance: June-01-2011 Description of Property: 1ST ADDITION TO CITY OF OKEECHOBEE LOTS 1 TO 4 INC E 1/2 OF LOT 5 LOTS 10 11 12 BLOCK 240 3-21-37-35-0020-02400-0010 Said property being in the County of Okeechobee, State of Florida Name in which assessed: N & A CONSTRUCTION INC NASER ABUEQAB Unless said certi cate shall be redeemed accor ding to law the property described in such certi cate shall be sold to the highest bidder at the Okeechobee County Judicial Center, Jury Assembly Room, 312 NW 3rd Street, Okeechobee, Florida 10:00 A.M. on the 20th day of February, 2014. SUBJECT TO CURRENT TAXES SHARON ROBERTSON, CLERK OF CIRCUIT COURT Okeechobee County, Florida /s/ Robin R. Parrish Deputy Clerk NOTICE REGARDING THE AMERICANS WITH DISABILITIES ACT OF 1990; In accordance with the Americans With Disabilities Act, persons needing a special accommodation to participate in this proceeding should contact Court Administration no later that seven days prior to the proceeding at 250 NW Country Club Drive, Port St. Lucie, Florida 34986, 1.772.807.4370 within two working days of your receipt of this notice. IF YOU ARE HEARING IMPAIRED CALL 1.800.955.8771; IF YOU ARE VOICE IMPAIRED CALL 1.800.955.8770. 457557 ON 1/10,17,24,31/2014 Public NoticeNOTICE OF APPLICATION FOR TAX DEED 2014TD051 NOTICE IS HEREBY GIVEN that TOM FELDT the holder of the following certi cate has led said certi cates for a tax deed to be issued thereon. The certi cate number and year of issuance, the description of the property, and the names in which it was assessed are as follows: Certi cate No: 79 Year of Issuance: June-01-2010 Description of Property: LOTS I AND J OF TRACT 14 E1/2 OF E1/2 OF N1/2 OF S1/2 OF TRACT 14 AND W1/2 OF E1/2 OF N1/2 OF S1/2 OF TRACT 14 09 34S 33E 1-09-34-33-0A00-00014-I000 Said property being in the County of Okeechobee, State of Florida Name in which assessed: FAUSTINA DILIDDO SABINO DILIDDO Unless said certi cate shall be redeemed accor ding to law the property described in such certi cate shall be sold to the highest bidder at the Okeechobee County Judicial Center, Jury Assembly Room, 312 NW 3rd Street, Okeechobee, Florida 10:00 A.M. on the 6th day of February, 2014. SUBJECT TO CURRENT TAXES SHARON ROBERTSON, CLERK OF CIRCUIT COURT Okeechobee County, Florida /s/ Robin R. Parrish Deputy Clerk NOTICE REGARDING THE AMERICANS WITH DISABILITIES ACT OF 1990; In accordance with the Americans With Disabilities Act, persons needing a special accommodation to participate in this proceeding should contact Court Administration no later that seven days prior to the proceeding at 250 NW Country Club Drive, Port St. Lucie, Florida 34986, 1.772.807.4370 within two working days of your receipt of this notice. IF YOU ARE HEARING IMPAIRED CALL 1.800.955.8771; IF YOU ARE VOICE IMPAIRED CALL 1.800.955.8770. 456914 ON 12/27/2013 1/3,10,17/2014 NOTICE UNDER FICTITIOUS NAME LAW PURSUANT TO SECTION 865.09, FLORIDA STATUTES NOTICE IS HEREBY GIVEN that the undersigned, desiring to engage in business under the ctitious name of Okeechobee The Magazine located at 316 NW 5th Street, in the County of Okeechobee, in the City of Okeechobee, Florida 34972 intends to register the said name with the Division of Corporations of the Florida Department of State, Tallahassee, Florida. Dated at Okeechobee, Florida, this 15th day of January, 2014. OTM Publications, Inc. 460324 ON 1/17/2014 Public Notice Public Notice 15 Okeechobee News January 17, 2014 Reading a newspaper makes you a more informed and interesting person.No wonder newspaper readers are more successful! No wonder newspaper readers are more successful! 2 Serving the communities south of Lake Okeechobee May 27, 2010 ROTARY CLUB OF OKEECHOBEE A PORTON OF THE PROCEEDS TO BENEFIT REAL LIFE CHILDRENS RANCH JANUARY 25, 2014 QUAIL CREEK PLANTATION 5PM TO 9PM THIS IS AN EVENT YOU WONT WANT TO MISS!! SPONSORSHIP OPPORTUNITIES AVAILABLE TICKETS $40 EACHSmoked Fish Dip Stuffed Jalaperos wtih Venison Swamp Cabbage Pheasant Axis Deer Frogs Legs Venison Kabobs Pulled Pork Red Stag Patties Quail Turkey Baked Beans Corn on the Cob Au Gratin Potatos Alligator Cup Cakes FOR INFORMATION PLEASE CONTACT DONNA GAISER 863-610-9416 CANVAS.SHOP@YAHOO.COM 18 Okeechobee News January 17, 2014 By Charles M. MurphyOkeechobee News Lamar Williams had 12 points, seven steals and eight rebounds as Yearling overcame upset minded Osceola, 32-25, to continue a long winning streak against their cross town rival in middle school boys basketball action Wednesday. The Bulls nished off another strong season with a huge defensive effort in this game as they held the Warriors to under 30 percent shooting. Ja Juan Cherry gave a huge effort for the W arriors who had their chances on offense but couldn't get the shots to fall. Yearling coach Mike Wharin said he felt his team played well and did a good job picking up the pace of the game after Osceola tried to slow down the tempo. He said his team's zone defense did a good job preventing Osceola from getting good shots and rebounds. "The emotion is the biggest challenge. I told the kids not to spend too much emotion and energy in the rst quarter. I hate to say this is a rivalry game. I wore blue today because we are all a team and these guys will all be together next year at the high school," he added. Yearling led 10-6 after the rst quarter thanks to late buckets by Williams and Kysell Richardson. Darius Houze had a strong rst half with a three point basket and a jump shot to give Osceola the lead 11-10 in the second quarter. Yearling led 16-13 at the half. The third quarter proved to be the difference as Yearling got some transition baskets and held the Warriors to only two points. Osceola led 25-15 after the third quarter. Richardson said he wanted to get everyone involved and that he is very con dent in his teammates. "It feels good to win. We matched their intensity and they matched ours," he said. "They talked a little bit before the game and coach said let our game do the talking and w e got the win today." Wharin said Yearling is proud of the fact they have beaten Osceola for the last several seasons. He said it adds to the motivation of his players to keep the streak going. "These guys earned it," said the YMS coach. "Even if the streak was broken, the team really worked through some hard times and injuries this year that limited us. I think the team did a great job." Futch, who missed most of the year with torn ligaments in his ankle, returned for the nal game of the year and provided a lift for the Bulls on both ends of the court. "It feels good to be playing again. I think this was a good win and a good bang to go out with as we go to high school," he said. Down the stretch, Richardson hit a 3-point basket and Janavise Futch hit a couple baskets to put Yearling in control. A scary moment occurred during a race for a loose ball that injured Warrior point guard Jermaine Moore. He was able to return to the game in the fourth quarter after being assisted off the court. Richardson said he felt badly when Moore was injured because they have known each other for years and played football together. "He is like a brother to me. I felt bad when he went down but in the end he was okay and that was good," he said. Richardson said his team expects to win and he felt this win was a total team effort, "It's a rival game but even if there talent isn't as high as ours a lot of fans show up and it gets intense," he said. W illiams 12 leads YMS in 32-25 basketball win Okeechobee News/ Charles MurphyKeith Davis looks for an open teammate as Lamar Williams (in white) looks on during Wednesdays game.